We love these Three Tempting Recipes for Chicken Fajitas, and they’re made in the Slow Cooker or Instant Pot to keep your kitchen cool and make it easier on the cook. This is a perfect family dinner for Taco Tuesday tomorrow; use low-carb tortillas or lettuce wraps if you want a low-carb meal! Click here to PIN Three Tempting Recipes for Chicken Fajitas! Click here for Three Terrific Recipes for Chicken Tostadas. We’re updating this post to spotlight Three Tempting Recipes for Chicken Fajitas to make in the Slow Cooker or Pressure Cooker. Any one of these chicken fajitas recipes would be a great addition to your dinner meal plan and don’t you agree that Slow Cooker or Instant Pot Chicken Fajitas are a great idea for Taco Tuesday dinner tomorrow? We’re featuring an instant pot fajita bowl with everything you need in one bowl, or two slow cooker options that could easily be served with low-carb tortillas or over cauliflower rice for a delicious low-carb meal. We know that fajitas made in the slow cooker or pressure cooker don’t have that fajita sizzle, but these recipes are still pretty delicious. Pick the recipe that looks the best, use the cooking method you prefer, and make some fajitas for dinner tonight! 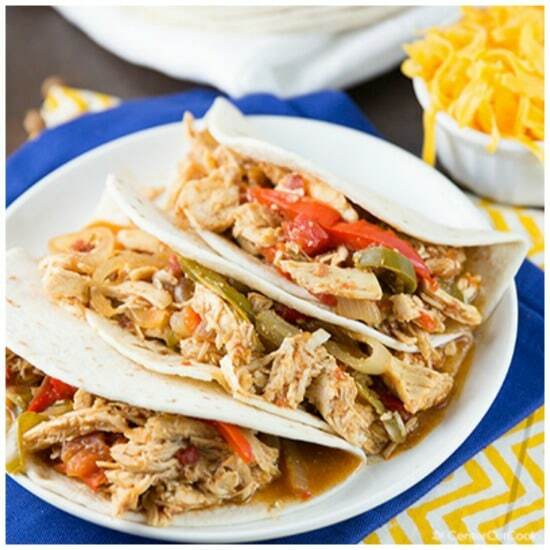 In this recipe for Chicken Fajitas in the Crockpot from Kalyn’s Kitchen, chicken breasts, red and green bell peppers, and onions are cooked with spices and lime juice, and then they’re served inside flour tortillas with salsa and sour cream. You can add other ingredients like cheese or guacamole if desired; serve in low-carb tortillas or over Cauliflower Rice for a low-carb meal. Karen says in this Instant Pot Chicken Fajita Bowls from 365 Days of Slow Cooking the pot-in-pot cooking method allows you to cook cilantro lime rice, seasoned chicken, onions and bell peppers all together in your electric pressure cooker in just a few minutes. Then layer in a bowl with cheese, sweet corn, tomatoes, black beans, sour cream and guacamole. This is a delicious one bowl meal! Easy Slow Cooker Chicken Fajitas from Center Cut Cook starts with chicken, colorful peppers, tomatoes, and some spices in the slow cooker. Simmer all day while you do other things, and by dinner time you will have created a satisfying, delicious meal with very little effort. This was soo good. Double the veggies and seasoning and you are good to go! Glad you liked it, and thanks for sharing your tips. I'll have to try that when I make it again. I knew that I needed to double the veggies when I saw the Mr. picking them all out, lol. I have also tried this over Cilantro Lime rice (from Skinnytaste) made with brown rice and it was superb! Holy Guacamole! You can make fajitas in a slow cooker??? Sign me up! Donna, they're really good. They don't quite have that "sizzled on a hot pan" thing going on, but still excellent. I have made many recipes from your site and loved them all. I am sad to say this was the first bomb. It turned out a big, soggy pile of food. The chicken was dried out and the rest was watery and without much flavor. Any ideas what might have caused this? I haven't had any major problems with this slow cooker before so I don't think that was the problem..
Al honestly, I have no idea why it didn't turn out for you. I've made this many times myself with good results and there are lots of good reviews on the original recipe at my site. Are you sure you followed instructions and cooking times as written?